Italian yacht builders Codecasa launch motor yacht FLYING DAGGER – Superyachts News, Luxury Yachts, Charter & Yachts for Sale. Italian yacht builders Codecasa launch motor yacht FLYING DAGGER a 41 meter completely aluminium superyacht. The superyacht was commissioned by a an owner who previously owned a 35 meter Codecasa motor yacht owner of a 2004 35m superyacht, also called M/Y FLYING DAGGER. The Codecasa 41 motor yacht features a sporty design and profile which was the design concept by yacht designer Andre Bacigalupo. 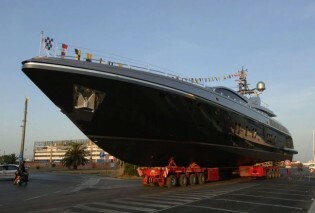 The yacht is expected to reach seeds of 34 knots using water jets. M/Y FLYING DAGGER has an 8m beam, and has been painted in a metallic anthracite silver / gray hull together with a metallic light gray for the superstructure. The superyacht has good outside space on her relaxation areas on the on main deck’s bow and her stern. There is also a sizeable sunbathing and entertainment space on FLYING DAGGER’s sun deck along with a bar corner and a second bridge station. Ivana Porfiri was responsible for the yacht’s interior styling which features a luminous living and dining areas, the result of large windows as well as a central skylight window. FLYING DAGGER also boasts glass ’sandwiches’ containing Palladio leaves which is a semi noble metal, with similarities to platinum, called “D’après Yves Klein”. This art work was handcrafted with leaves partially attached to the panel and was inspired by the famous French artist. The interior colour theme is white as off set with a wide range of textures used in the design with methods of brushed, painted, plastered or using leather. The motor yacht’s crew area is equipped and designed with a dinette and independent galley.